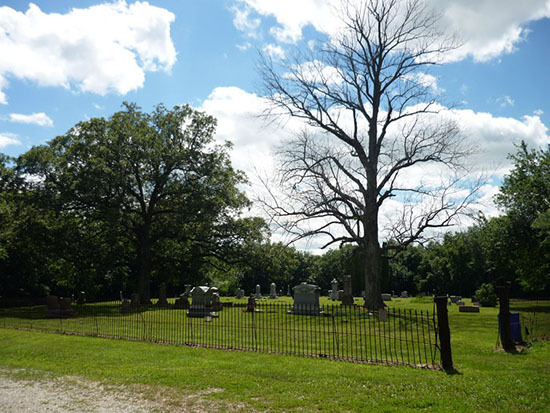 Peck Cemetery is located in the northeastern part of Macon County, near the towns of Oakley and Cerro Gordo. The cemetery is an isolated place, enclosed by a rusted iron fence, and it is hidden from the road by thick woods. It is surrounded by heavy forest and trees loom over the grounds. In addition, the graveyard is accessible only by way of a rutted dirt road and through a metal gate, which is usually kept locked. Trespassers are not welcome here. The reason for this is because since the 1970's, Peck Cemetery has been a popular place for teenagers to go and have parties and attempt to scare themselves silly. If this were the end of it, that would not be a problem. Unfortunately, a small minority of these teenagers have also felt the need to vandalize the cemetery. The burial ground is now in deplorable condition as the majority of the stones have been toppled and broken, have been turned over and even have been sprayed with bright paint. There are very few of the monuments now standing upright and many of these lean dangerously to the side, thanks to digging that has been done around their bases. And vandalism was not the only thing that added to the reputation of the cemetery either. It was also believed to be a haven for occult groups who were trying to tap into the negative energy of the place. And while I think that most alleged "Satanists" are little more than disturbed teenagers and that most "devil worshipping cults" are simply the fevered imaginings of fundamentalist religious groups trying to scare the general public, there are some pretty scary people out there. There are people who do take the occult very seriously and I have it on pretty good authority that some of them used to gravitate to Peck Cemetery. While the stories may have grown a little larger than life over the years, some pretty strange and bizarre things have taken place here. Satanic cultists aside though, stories had been told for a number of years that suggested that something lurked in this cemetery. There were many tales told about the place and witnesses and late night visitors to the cemetery had come forward to claim a number of strange happenings and to recall many frightening events. Such stories included apparitions in the graveyard; inexplicable cries; whispers and voices; hooded figures; eerie lights; and even the sound of a woman's scream that seemed to come from nowhere. This photo only gives you a small amount of the damage that has been done over the last couple of decades in Peck Cemetery. This headless statue did not come from any monument in Peck Cemetery. It, and the blood poured over the base over the neck, was left behind by cultists who practice in the cemetery. Peck Cemetery is a pretty tragic place really and one that has always been of great interest to me. It was here, back when I was in high school, that I had my first encounter with something that I was not able to explain. I have recounted this event many times over the years and I have to tell you ---- I get goosebumps every time that I re-tell the story. I first heard about Peck Cemetery from other students at my school and thanks to my interest in the subject, I managed to collect some other strange tales from students at other area schools as well. I was determined to see this place, no matter how hard it apparently was to find. Because of its remote location, I needed to track down someone who had already been there and soon found a couple of acquaintances who had made the trip ---- and returned! I was informed that it was a matter of bravery for visitors to the cemetery to go there late at night and to park their cars at the gates to the graveyard with their headlights pointed inside. As the gate was located at one corner of Peck Cemetery, they could literally angle their car so that the headlights would shine back to the farthest corner. The visitor's courage came into question when they left the car and walked all the way to this dark corner and then turned and walked back. It doesn't sound like much to the reader, I'm sure, but take my word for it ---- it was not a pleasant prospect when you actually arrived at the place. According to my friends, they knew of a student at another school (of course!) who had gone to Peck Cemetery one night and was completing the challenge when a ghost actually came up out of the ground in front of him! Needless to say, he ran from the graveyard and never went back. After hearing this, I wanted to see the place more than ever and made arrangements with my friends for them to take me out there on the following Saturday night. Even then, I was more than a little bit of a skeptic when it came to other people's encounters but I figured that since there were so many stories told about this one location, at least a few of them had to be true, right? A few nights later, we made the trip out to Peck Cemetery. It was (believe it or not) a dark and stormy night and as we turned off the hard road and onto the gravel lane that ran back to the woods and the cemetery, everyone in the car grew quiet. As we traveled along the rutted lane, we followed it as it dipped down into a low area that was filled with a spooky fog. I would later learn that this fog was almost always present during the humid summer months, but it was especially unnerving on that night. After we reached the top of the hill on the other side, we turned the car sharply to the left so that the nose of it was up to the cemetery gates. The headlights stretched out in front of us and illuminated the jumble of broken stones and the glistening raindrops on the overhanging tree branches. Unfortunately, it was what the lights did not illuminate that had me bothered ---- namely the far corner of the cemetery, which we planned to walk to in just a few moments. My friend turned off the ignition of his vintage Camaro and we sat there for a moment in silence. There was absolutely no sound but the drip of water on the roof of the automobile. I think that at this point, we had managed to spook ourselves so badly that if one of us had suggested that we leave and go home, we likely all would have agreed. As it was though, no one did and we quietly got out of the car. Once outside, we finally realized how nervous we had been making ourselves and we started to relax. Joking and laughing, we started off across the cemetery, following the twin beams of light that pointed off into the darkness. As we walked further and further away from the car, the laughter ended and we began to pick up the pace a little bit. I know that I simply wanted to get to the other side of the cemetery and then get back again. I can't really explain what made me feel this way (and I am sure my friends shared the feeling) but if you ever get the chance to visit Peck Cemetery, you will understand it. There is just a bad feeling here, a coldness that seeps into your bones and leaves you with an uncomfortable sensation that you just can't put your finger on. Within a few minutes, we had reached the farthest corner of the graveyard and we turned to start back towards the car. We must have breathed a small sigh of relief as well. Nothing had occurred on the trip over ---- no eerie lights, no ghosts and not even a single sound, save for the rain that was dripping off the trees. Feeling much bolder, we began walking back to the car, wandering to look at some of the vandalized tombstones as we made our way back. We were convinced by this time that nothing out of the ordinary was going to occur. We were wrong. We had reached the halfway point on our return trip when suddenly, the headlights on the car that we had left at the cemetery gates snapped out! The graveyard was plunged into darkness! Needless to say, we froze where we were standing. We now had a major predicament on our hands --- the question was whether to run back to the car, and possibly meet whatever had turned out the headlights, or to simply stay where we were, in a cemetery that we now had started to believe just might be haunted after all! We argued both points for a few moments, mostly concerned about the fact that the doors to the car had been locked. How had the lights been turned out? We decided to compromise. We would return to the car, we agreed, but we would do so very, very cautiously. You see, those tales of ax-wielding Satanists in black robes didn't seem quite so silly anymore! The four of us managed to get all of the way back across the cemetery and we crept up on the silent, and now darkened, automobile. After peering under the car and into the shadowy backseat, we determined that no one was hiding nearby. However, we had not solved the mystery of how the headlights had turned out. Could the battery have gone dead? Were we going to be stranded out here until someone came along to help us? Concerned, the driver quickly unlocked the door and started to get inside. He was about halfway into the car when he stopped and his face turned white. His eyes were big when he looked over at me and he hurriedly climbed back out of the car again, stumbling a few feet away from the vehicle. We asked him what was wrong and he simply told us that we needed to come and see how the lights had been turned out. Keep in mind, this was a 1960's-era automobile and there were no fancy switches or time delays to control the headlights. The lights turned on and off by way of a knob that was fitted into the dash ---- a knob that you pulled out to turn the lights on and pushed in to turn them off. My friend had left the knob pulled out when we had exited the car and started across the cemetery. Short of this knob, the only way that the headlights could have been turned out would have been to have the battery die during the few minutes when we were walking in the graveyard. My return to Peck Cemetery coincided with the release of my first book in the middle 1990's. At that time, I started collecting new stories about Peck Cemetery and people's encounters with the unknown at the small burial ground. 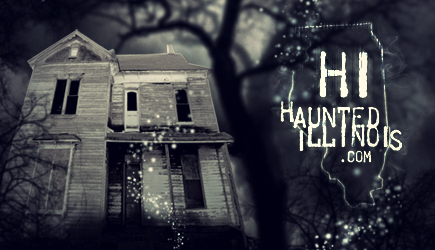 I heard all sorts of stories, from the lights and sounds described earlier to first-hand accounts of actual apparitions. One young woman that I spoke with told me of a weird encounter that she and several girlfriends had at the cemetery. She related the story in 1998, about ten years after it had happened. She had forgotten none of the details during that time though --- what happened was too frightening for her to forget. 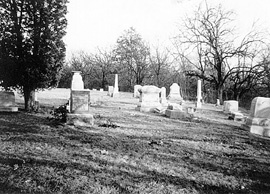 The group of young women had come to the graveyard very late one night and had driven up the dirt road and around the corner to the left, where the cemetery gates are located. It was very dark and all of them were nervous and excited about the trip. However, my witness promised me that their nervousness in no way influenced what they all saw. They parked the car outside of the cemetery and everyone got out. As it had been with my friends and I a few years before, the girls decided to test their courage by walking across the cemetery and back. This was a common practice for high school students from all around the Decatur area. In a giggling cluster, they began walking out among the graves. "And that's when we saw him," she told me. The young women were just entering the grounds when they saw a man standing near one of the large, fallen tombstones. After they got over their initial shock and surprise, they were curious as to how he had gotten there. They hadn't seen any other cars nearby and hadn't seen anyone go past them into the cemetery. One of the girls started to speak to him and then he just wasn't there anymore. He had simply vanished. "I know I saw him and the others did too," she assured me. "He looked very solid and not like a ghost or anything. He had dark hair and was wearing a coat. I just assumed that he had come there like we did, but all of the sudden he was just gone. And so were we! We ran back to the car and I have never been out to that place since!" I have spoken to other people who have also had bizarre and often scary experiences at Peck Cemetery. My only explanation for the things that go on here is the one that I have already offered --- that this place is haunted! Believe me when I tell you that it does not take a psychic to know that something is wrong in this place. You can literally feel it when you leave the old road and pass through the gates. There is a certain coldness and a feeling of oppression here that nature cannot explain. It is not a good place --- and sadly, it hasn't been one for a long time now.